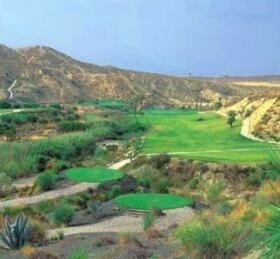 The Marina Golf Club is sited within the Marina de la Torre estate, overlooking the sea at the foot of the hills from which the whitewashed Moorish town of Mojacar dominates the surrounded area. There are two hotels here, the Hotel Servigroup Marina Mar and the Hotel Servigroup Marina Playa, both are within a short 7 iron of the club house and the convenience of this golf course cannot be ignored. The Marina Golf Course has two distinct halves! 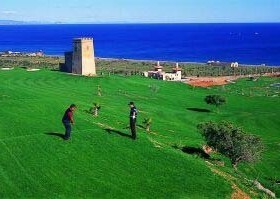 The first 3 holes are on a plateau overlooking the sea with spectacular views. You are then treated to one of the most spectacular golf holes in Spain, the Par five 4th hole, as you climb the rocks you are left to play another 10 holes in a truly peaceful valley. Its then back to the beach view plateau for the remaining holes. Buggies, Hand and electric trolleys, Driving range, Putting green, Club hire, Golf lessons.